Deborah Lytton is an established writer who began her work life as an actress at the age of six. She graduated from UCLA and Pepperdine University with a degree in law before becoming a writer. She lives in California with her two daughters and is an active blogger and member of SCBWI. 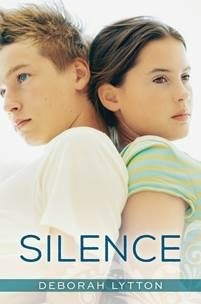 Silence is a beautiful love story that captures the hope that exists even in the midst of darkness and pain. When rising star, Stella loses her hearing in a pool accident, she faces not only the loss of her musical gift, but also the loss of her identity as a person. She’d pinned all her future hopes on the goal of Someday Broadway after her parents’ divorce. Now, she must figure out what else is worth living for, and Hayden, a boy with his own mysterious, dark past, can help her do just that. If she will let herself trust him. This book read more like poetry than a novel in many places. The prose was lyrical and almost like a song itself. It is told in first person present tense, which I don’t mind, but others might find difficult to get into. The main characters were both a mix of real and ethereal. Hayden with his stutter and ability to read things so clearly, and Stella’s sensational voice with her broken family and now lost hearing brought depth to the book. It is a beautiful, clean story of courage to live and love that is more than just skin deep. A couple things in the book, did bother me. The word “I” is used a ton. I know it is difficult to avoid that with first person books, but even taking that in account, it got a bit annoying at times. Another slight annoyance came more from my study and involvement in the deaf culture. While I thought it was cool to read lips and use technology, I would have liked to see the option of sign language and other ways of communicating explored a little. Also, while cochlear implants can sometimes restore someone’s hearing, it is rarely, if ever, to one hundred percent. Usually, it is only a small portion that is restored, and the implant causes added difficulties that weren't mentioned. The process was presented as an easy fix, which didn't strike me as realistic. For the most part, I thought this was a very sweet YA romance that is great for teenage girls. I’m definitely going to check out Deborah Lytton’s other books. Cragbridge Series Book 3 . . . Now Available!